Before PowerArchiver, it was known as EasyZip programmed by a Russian named Ivan Petrovic. 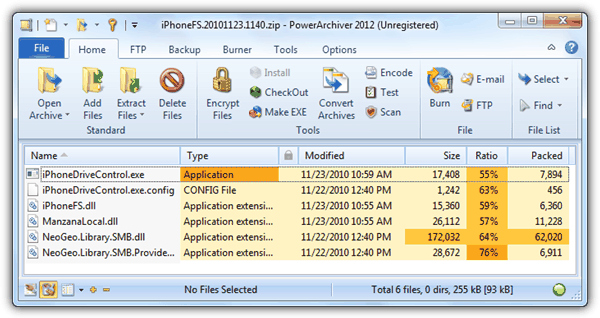 In year 2000, EasyZip disappeared and was renamed to PowerArchiver. A year later PowerArchiver was funded by an American company named ConeXware while Ivan Petrovic is still the head engineer today. Initially PowerArchiver was a freeware which gained a lot of popularity because of the simplicity yet comes with powerful file compression features. Starting from version 7 of PowerArchiver, it has turned into a shareware and maintains this licensing system even in the current version 13. That’s a little about the history of PowerArchiver. Now let us show you why PowerArchiver is one of our favorite compression software. Back in the days when WinZIP was one of the very few compression software available, we made a jump from WinZIP to PowerArchiver and it didn’t take us very long to get use to PowerArchiver because of the familiar graphical user interface that resembles WinZIP. The current PowerArchiver comes with a modern ribbon toolbar by default but you can switch it to the classic toolbar from the options to get back the old feel. In one of our tests where we benchmarked 15 different archivers and found that PowerArchiver took the least time to extract while it also excels in the rest of the tests. The shocking part is PowerArchiver can even extract RAR archives 10% faster than WinRAR. Another important feature in an archiver is it must support many different types of archive formats so that you don’t need to search, download and install the native program in order to open the archive. PowerArchiver is able to open over 50 different archive extensions from the common ones such as ZIP and RAR to the unknown ones like .ZOO and .NCO. You can find all of the common features that should be available on an archiver software such as batch extract or compress, creating self-extractor to extract the files without an archiver software, repair damaged archive files, archive encryption, convert archive from one type to another such as ZIP to 7z, file encoding, testing and also integration with an antivirus software. It also has a preview function to see the content of the files in an archive without require to extract it. Compressing a file that is in used is no longer a problem since PowerArchiver supports VSS. Although PowerArchiver is a shareware that comes with a free 30 days trial, but you can still continue to use it even when after trial period expires by clicking the I Agree button on the nag screen. The I Agree button will be grayed out (disabled) for a few seconds and after that it will be clickable. We noticed that the delay for the I Agree button to be enabled tends to increase by 1 second in every few months. All the common compress and uncompress functions will still work except the features found in the Professional and Toolbox editions. 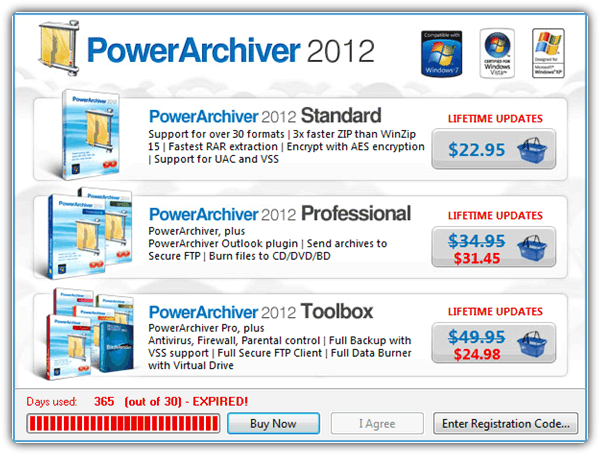 If you really like PowerArchiver like how we couldn’t live without it and don’t want the nag screen, it cost $22.95 for the standard version, $31.45 for the professional and $39.96 for the toolbox. All editions comes with lifetime upgrades although the Bitdefender Internet Security in the Toolbox only valid for 1 year.